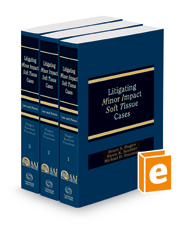 This guide, plus CD, provides plaintiff attorneys with legal and medical guidance on handling minor impact soft tissue cases. It provides a look at software used by the auto insurance companies and more than 100 forms to assist with case preparation. Bruce Hagen joined as a new author to this edition, adding an additional perspective. New Chapter 21, Social Media and Discovery. Social media continues to grow exponentially. With more than 74% of online adults using social networking sites, the parties’ social media disclosures can make or significantly undermine your minor impact soft tissue case; with sample litigation forms. New Chapter 31, Establishing the Credibility of Your Client. Establishing and maintaining your client’s credibility is the key to damages in every soft tissue case, and this chapter discusses the things you can do to both preserve and enhance your client’s credibility to maximize your chances of success at trial; with sample litigation forms. Revised § 8:3 Developing intake criteria; examining successful trial and appellate court outcomes from the end of 2014 to date.